President Donald Trump speaks during a meeting with Baltic leaders in the Cabinet Room of the White House, Tuesday, April 3, 2018, in Washington. 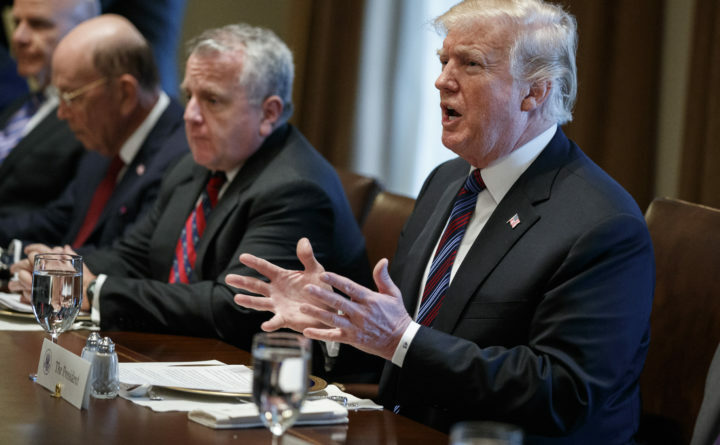 WASHINGTON — President Donald Trump said Tuesday he wants to use the military to secure the U.S.-Mexico border until his promised border wall is built. Speaking at a lunch with Baltic leaders, Trump said he’d already discussed the idea with Defense Secretary Jim Mattis. Trump’s announcement came a day administration officials said they’re crafting a new legislative package aimed at closing immigration “loopholes.” Trump has called on Republican lawmakers to immediately pass a border bill using the “Nuclear Option if necessary” to muscle it through. “The big Caravan of People from Honduras, now coming across Mexico and heading to our “Weak Laws” Border, had better be stopped before it gets there. Cash cow NAFTA is in play, as is foreign aid to Honduras and the countries that allow this to happen. Congress MUST ACT NOW!” Trump tweeted at daybreak Tuesday. The president also tweeted about “caravans” on Sunday and Monday. The president has been tweeting about immigration and the border for the last few days, declaring protections for so-called Dreamer immigrants “dead,” accusing Democrats of allowing “open borders, drugs and crime” and warning Mexico to halt the passage of “caravans” of immigrants or risk U.S. abandonment of the North American Free Trade Agreement. Trump has been seething since realizing the major spending bill he signed last month barely funds the “big, beautiful” border wall he has promised supporters. The $1.3 trillion funding package included $1.6 billion in border wall spending, but much of that money can be used only to repair existing segments, not to build new sections. Among the new measures the administration is pursuing: ending special safeguards that prevent the immediate deportation of children arrested at the border and traveling alone. Under current law, unaccompanied children from countries that don’t border the U.S. are turned over to the Department of Health and Human Services and undergo often lengthy deportation proceedings before an immigration judge instead of being deported. Trump announced last year that he was ending the program that protects young “Dreamer” immigrants, but the Department of Homeland Security is continuing to issue renewals because of a court order. Notably, his favored solution for extending protections to them mustered only 39 votes in the Senate, meaning it couldn’t have passed even if the rules had been changed. Trump’s tweets calling on Mexico to halt “caravans” followed a “Fox & Friends” report Sunday that featured the leader of the union representing border patrol agents predicting that those in the caravan would create havoc and chaos in the U.S. as they wait for immigration reform. About 1,100 migrants, many from Honduras, have been marching along roadsides and train tracks in the southern Mexican state of Oaxaca. Individuals in the caravans often try to reach the U.S. border but usually not as part of the caravan. The caravans typically don’t proceed much farther north than the Gulf Coast state of Veracruz. The current march is scheduled to end this month with a conference on migration issues in the central Mexican state of Puebla. Associated Press writers Elliot Spagat in San Diego; Catherine Lucey, Darlene Superville, Lisa Mascaro, Kevin Freking and Zeke Miller in Washington; and Mark Stevenson in Mexico City contributed to this report.